Arrive to Base Camp in style with your very own "Bell Tent" set up and waiting for you on a 20'x20' grass site. 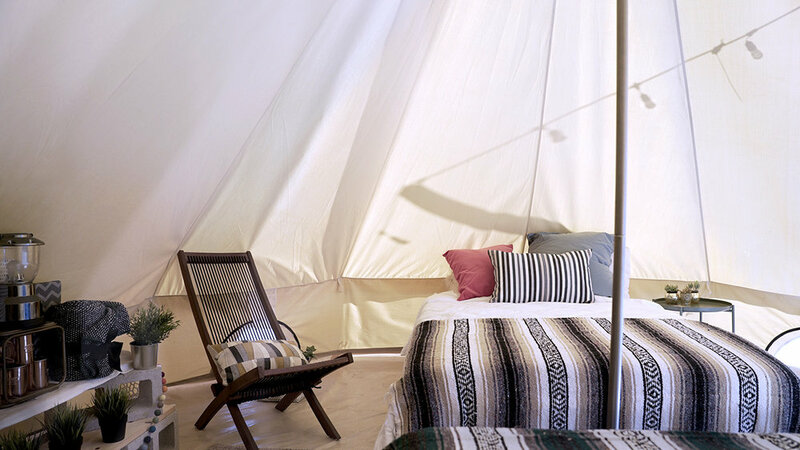 Each Bell Tent is available unfurnished or fully furnished (with your choice of one or two full-size beds) and stands 16' in diameter (200 total square feet) and 9.5' tall at the center. Ventilation comes from a fully closable front screen door as well as 4 closable sidewall screen windows and 3 screened vents at the apex. The Bell Tent will be fully constructed upon your arrival and taken down upon your departure. 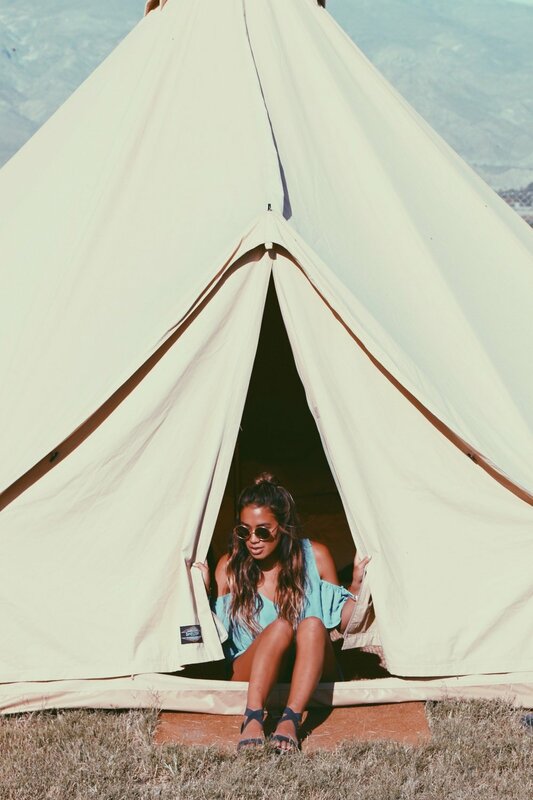 The fully furnished Bell Tents are large enough to sleep 2-4 adults comfortably and unfurnished Bell Tents can sleep 4-6 comfortably (although there is no limit to the number of guests in each luxury tent - all guests must be included in your reservation). Furnished Two Bed Bell Tent - $399 per night, includes 2 people (3 night minimum). Additional guests are $59 per night. 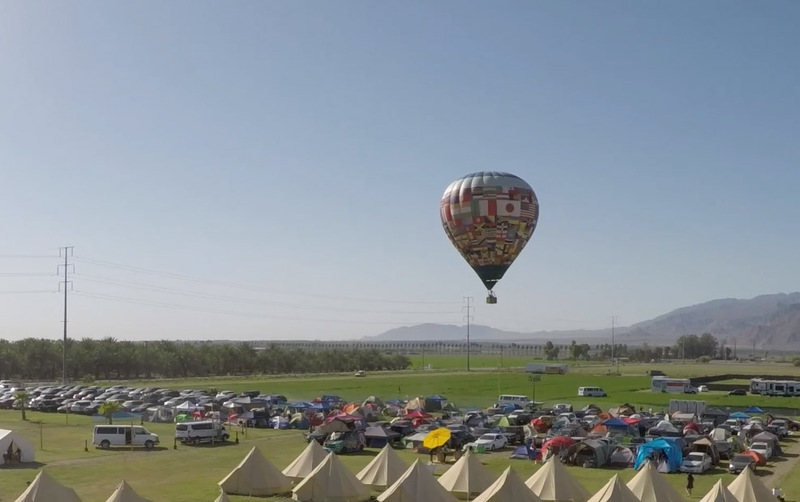 Cloud 9 Village has joined Base Camp! 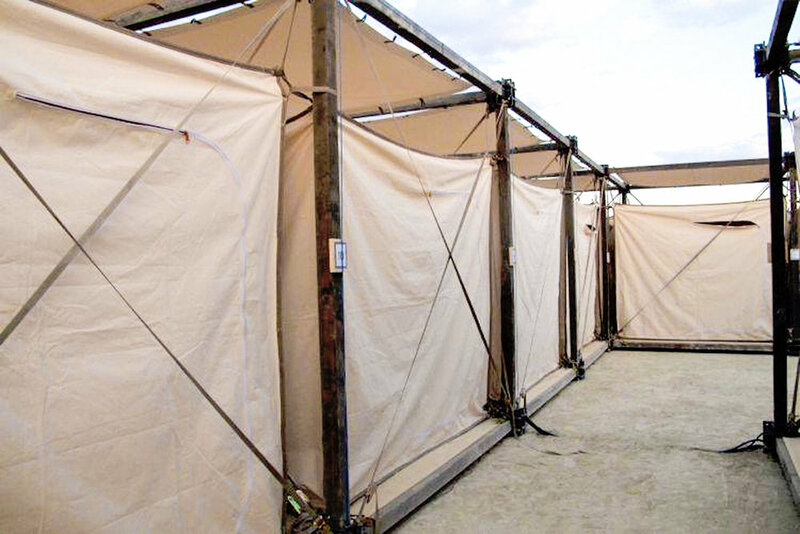 We are excited to announce that Cloud 9 Village will be partnering with Base Camp to feature their 10'x10' or 10'x20' "Cube" lodging options (also known as the "Lost Hotel" when constructed at Burning Man). Each 10'x10' Cube features one full size bed and each 10'x20' Cube features one queen size bed. Each option includes 2 people. Additional guests can be added for $59 per person, per night. Furnished 10'x10' Cube - $299 per night, includes 2 people (3 night minimum). Additional guests are $59 per night. Furnished 10'x20' Cube- - $349 per night, includes 2 people (3 night minimum). Additional guests are $59 per night. Base Camp 'Car Camping Sites' are approximately 10'x30' grass sites. All 'Car Camping' sites must have one car and your tent(s) + gear must fit inside the site. Please note that there are no "in's & out's" with the vehicle in your 'Car Camping' site. Once your car is parked it must stay in your site for the duration of your stay. You may bring a pop-up tent for shade and other camping supplies as long as everything fits within your site (we also ask that you please collapse all pop-up tents when you leave in case of high winds). 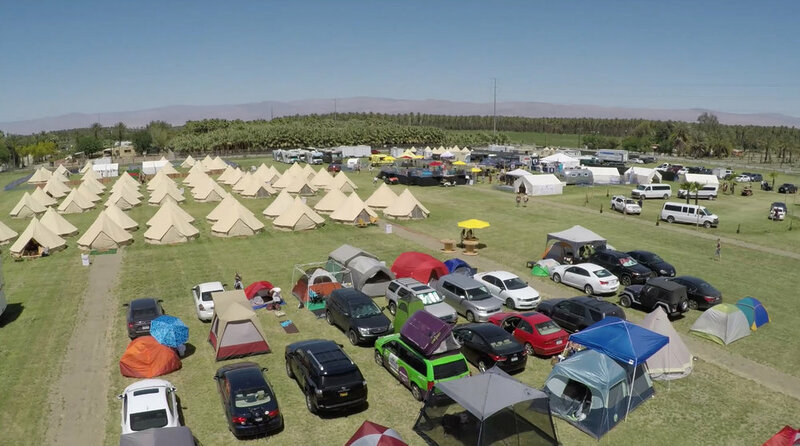 There is no limit to the amount of guests staying in your car camping site although every person must be included in your reservation. Car & Tent are not included in your nightly rate, you must bring your own. 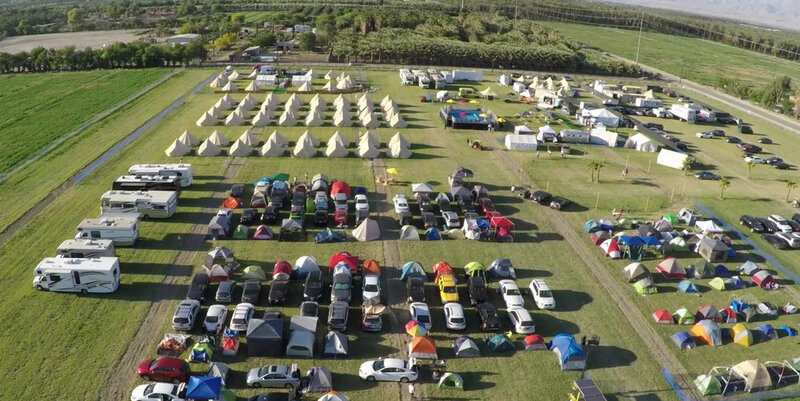 Car Camping Site - $139 per night, includes 2 people (2 night minimum). Additional guests are $59 per night. Base Camp 'Tent Sites' are approximately 12'x12' grass sites. Upon arrival, you will be directed to your campsite to unload your vehicle from just a few feet away. You will then park your vehicle in our general parking lot (parking is free). You may bring a pop-up tent for shade and other camping supplies as long as everything fits within your site (we also ask that you please collapse all pop-up tents when you leave in case of high winds). There is no limit to the amount of guests staying in your tent site although every person must be included in your reservation. Tent is not included in your nightly rate, you must bring your own. Tent Camping Site - $118 per night, includes 2 people (2 night minimum). Additional guests are $59 per night. Base Camp 'RV Sites' are approximately 15' x 40' grass sites. Electric service is available for $250 for the weekend. We do not offer water or sewer hook-ups so please be sure to show up with a full water tank and empty sewer tank! Contact our official RV partner, So Cal RV's for a discounted rate. 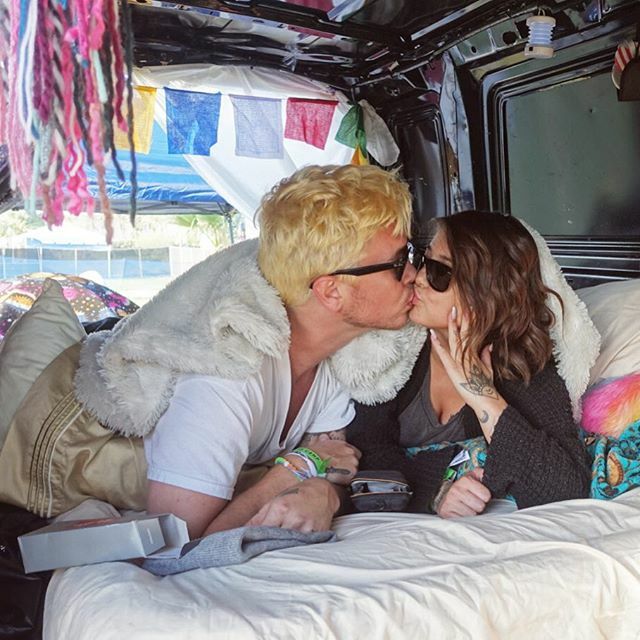 There is no limit to the amount of guests staying in your RV although every person must be included in your reservation. Please note that there are no "in's & out's" with your RV. Once it is parked it must stay in your site for the duration of your stay. 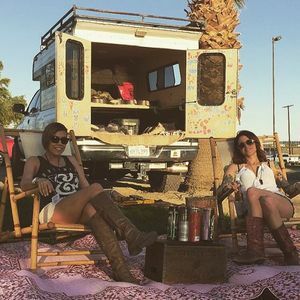 RV Site - $159 per night, includes 2 people (2 night minimum). Additional guests are $59 per night. Electric Hook Up - $250 for entire weekend.